PM Modi's Mann Ki Baat programme was first aired on October 3, 2014 which coincided with Dussehra followed by the second, broadcast on November 2. PM Modi’s Mann Ki Baat programme was first aired on October 3, 2014 which coincided with Dussehra followed by the second, broadcast on November 2. 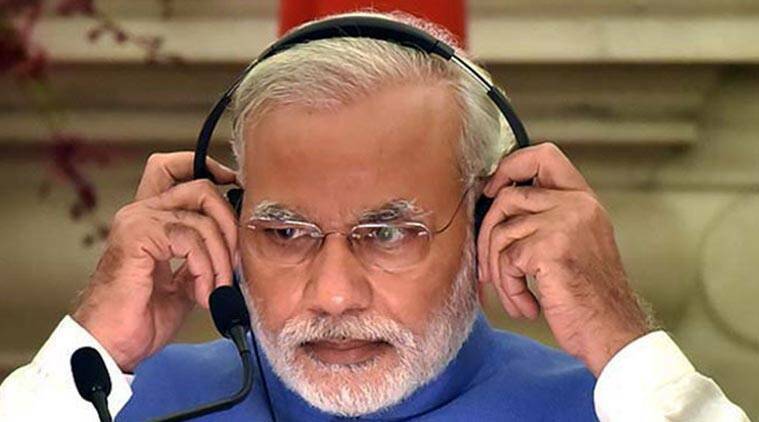 On the first anniversary of his monthly radio broadcast ‘Mann Ki Baat’, Prime Minister Narendra Modi today thanked all those who shared their inputs, thoughts and anecdotes for the programme launched to reach out to maximum populace across the country. To mark the occasion, public broadcaster All India Radio (AIR) announced a special radio show captioned ‘Mann Ki Baat: Ek Saal Jan Judao Ka’, which will be telecast on October 5, and it has also planned a survey to gauge the impact of the programme. The Mann Ki Baat programme was first aired on October 3, 2014 which coincided with Dussehra followed by the second, broadcast on November 2. “This day, this time, last year…1st #MannKiBaat programme was held, marking the start of a special journey. “I thank you for enriching every #MannKiBaat episode with your thoughts, inputs & anecdotes. They add life to the programme,” Modi tweeted. Radio was chosen as the medium for the programme with an aim to reach out to the general masses in every nook and corner of the country. It was the first such initiative by any Prime Minister. The hour long show will be relayed by all capital AIR stations, all multi-channel stations, all FM Gold and FM Rainbow channels, Local Stations and will be available on internet and through AIR’s mobile app, it added. The programme has been conceptualised as a platform for myriad voices, ranging from the remotest outpost of the country to the heart of its capital to a diaspora viewpoint. “We are hopeful of presenting a bouquet of authentic voices from the rustic farmer to the erudite journalist and the suave cine-star in this attempt to reflect with authenticity what the public really expects from its Prime Minister,” a statement released here said. The broadcast of the programme will be followed by an Audience Research survey to be carried out by 46 Units of Audience Research Units of AIR located at different places, in a manner that makes it cover varied linguistic and geographical zones of India, the statement said. This will accurately gauge the impact of one year of continuous personal contact of the Prime Minister with his people through various modes of dissemination, it added. In his first Mann Ki Baat programme, Modi had given a pep talk on shedding despondency and use of skills for the country’s betterment and prosperity while urging people to generate confidence among themselves. He often invites ideas from the citizens ahead of Mann Ki Baat programme. In his second radio broadcast on November 2, the Prime Minister had promised to get back every penny of the black money stashed abroad while in the third programme, he had talked about the menace of drug addiction. US President Barack Obama had participated in the radio programme with Modi in its fourth edition on January 27 this year. The 12th edition of ‘Mann Ki Baat’ was aired on September 20 in which he had said he would be receiving family members of Subhash Chandra Bose in October. Mann Ki Baat is vastest disseminated broadcast and reaches over 99 percent of Indian population through multifarious avenues as DTH, Live Streaming, Mobile Applications, Terrestrial as well as Satellite Channels, AIR said. It added that besides the special show, AIR has already broadcast a special edition of much acclaimed programme Post Box 111 which is based on unprecedented inflow of letters or mails from listeners to All India Radio based on ‘Mann ki Baat’.